Hockey is Canada’s game, and anyone who has been involved with the sport knows that hockey has a way of creating lasting bonds between team members. Seamus Daley, who was born and raised in Lethbridge, created a lot of enduring relationships in his lifetime, many of which developed on the ice. 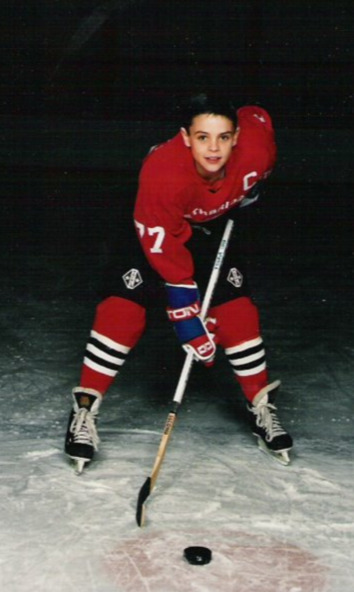 Seamus began playing hockey at a young age, and was well known in southern Alberta for his on-ice skills. Even after a sustaining an injury that prevented him from taking his career any further than minor hockey, Seamus continued to play recreationally out of sheer love of the game. To the shock and heartbreak of those who knew him, Seamus’s life was cut tragically short in April 2006 when he passed away in a drowning accident. He was just 26 years old when he died, but his impact on those who knew him was profound, and thanks to a scholarship his friends and family recently created in his name at the University of Lethbridge, countless others who never had the chance to meet Seamus will benefit from his passion for life and the sport. The Seamus Daley Memorial Hockey Award was established in 2018 in tribute to Seamus’s zest for life and the game he loved. The $1,000 annual scholarship will be paid to a Pronghorn men’s hockey player who resides in the Lethbridge area. Born out of a trust fund created the year of Seamus’s passing, Neil says the award is the perfect way to carry his friend’s legacy forward. The trust fund is supported by the Seamus Daley Memorial Golf and Hockey tournaments, which are held each year. Neil says that Seamus was never someone who craved the spotlight, but thinks his friend would be very happy to know that through the award other hockey players will have a chance to get an education and play the game.